Sometimes we developers are curious to know which technologies are used in building a website showing in our browser tab. 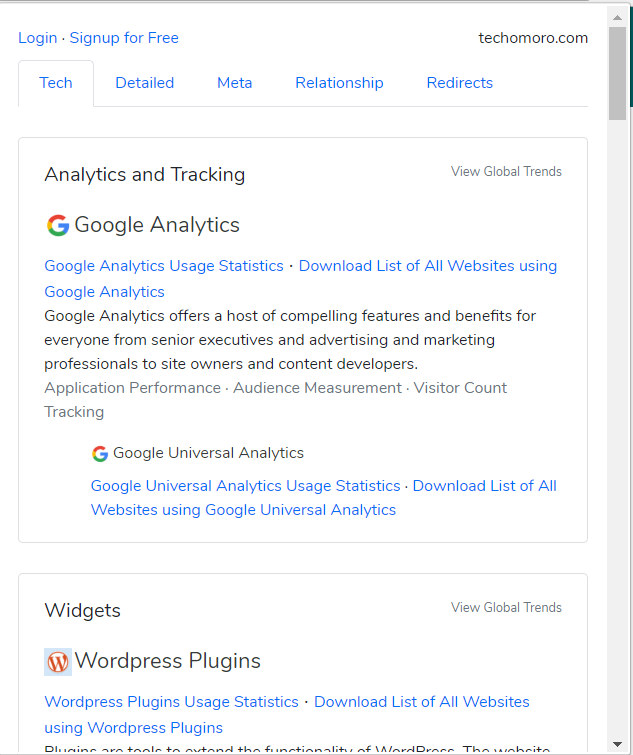 A website we are seeing on our browser may use a lot of stuff such as web programming languages, frameworks, CDNs, widgets, CMS, fonts, Analytics, Servers etc. 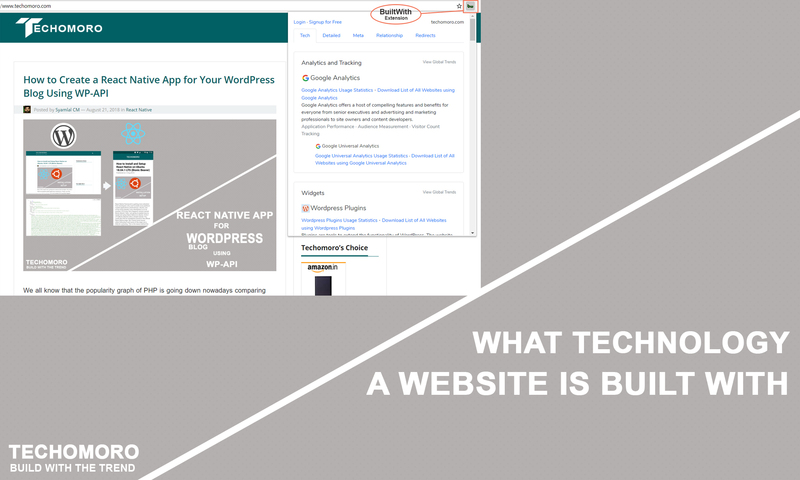 A perfect combination of these technologies will deliver a perfect website. So we need to study a lot of websites and what are the technologies used by them to make something new. I am going to explain the usage of BuiltWith only because in general, all the tools above contain the same functions. As the caption on the homepage says, you can find out what websites are built using BuiltWith. It covers 27,712+ internet technologies which include analytics, advertising, hosting, CMS and many more. 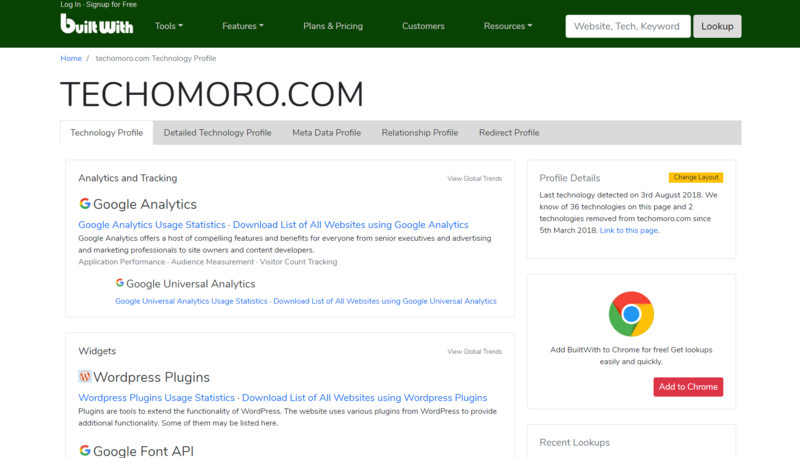 There is an input field in the homepage and you can enter or paste a web address or URL(eg:- https://www.techomoro.com) there and clicking the Lookup button will load the all stuff to build that website. If you are curious to know about a technology (eg:- Laravel), you can also search for it in the same input field. BuiltWith offers you many more other features with a monthly or yearly subscription option. Now the most beneficiary part of this tool is that it contains a Chrome extension also. You can install it by clicking the Add to Chrome link in the BuiltWith website. 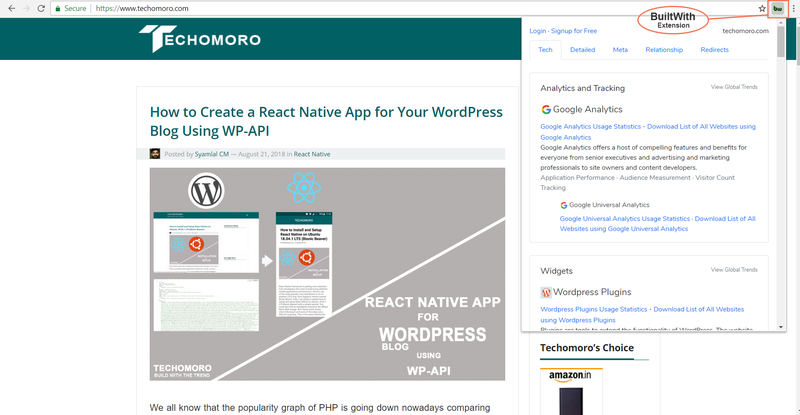 Installing this extension will allow you to easily find the technologies of a website that is opened in the Chrome browser by tapping the BuiltWith icon (bw) on the top right of the chrome browser. Beyond the technologies in building a website, BuiltWith can also give you information on Details of the technologies, Metadata on the website, Relationship history of the website, Redirecting links inside the website etc. The other tools I have mentioned on the top also have its importance. It’s better to check those also.